First make the cheesy mixture by mixing together 1 egg, 250g cheese and the mustard. Turn the toast over and put the ham on the uncooked side making sure it is just inside the edge of the bread. Cover the bread with the cheesy mixture spreading it right to the edge. Put the toast back under the grill to melt the cheesy mixture all over the bread. 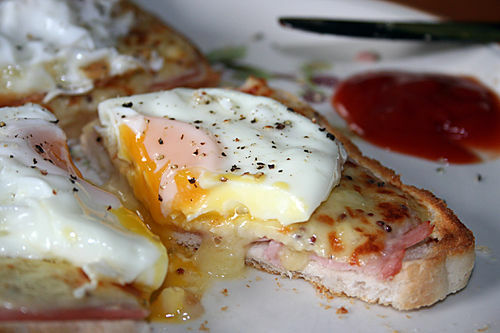 Remove the toast from the grill and place on your plate, top with a fried egg and pepper!